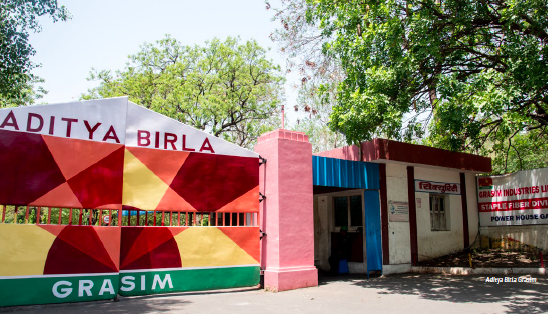 The largest viscose fibre plant in India may be linked to crop damage, water scarcity, pollution, disease and severe occupational health hazards. “Aditya Birla is part of the Canopy Commitment and is ranked second best in terms of forest issues. Brands buying viscose from Aditya Birla are: H&M (Sweden), ASOS (UK), Marks & Spencer (UK), Tesco (UK), Zara/Inditex (Spain), Levi’s (US), United Colors of Benetton (Italy), Burton (UK), Next (UK), ASDA (UK), Dockers (US), Debenhams (UK), Matalan (UK), Van Heusen (US) and Haggar (US)” . Viscose production has had a big role in the modernisation of India, which is the second largest producer of viscose fibre after China . Aditya Birla Group is a huge player in the industry, and Grasim Industries is the subsidiary which produces viscose across India . Grasim Industries was established in 1947 and it started its Viscose Staple Fibre (VSF) production in 1954 at Nagda in Madhya Pradesh . Before the town was industrialised, Nagda used to be mostly agricultural land. In 1952, Grasim Industries acquired land for the construction of the viscose plant . The now industrial town of Nagda is located on the banks of the Chambal River, which is where Grasim Industries source their water from for the production of viscose. The Chambal river is also the main source of water for all the villages that are situated down and up stream from Nagda. The main issue for villages downstream from the Grasim plant is the toxic chemicals polluting the river water, whereas for the villages upstream, the main issue becomes losing access to water as it is scarce and most of it is grabbed by Grasim Industries (Viscose production requires a large amount of water) . Because water is a scarce resource and the area is heavily dependent on monsoons for the river to have enough water, the Grasim plant has been forced to shut down several times when there hasn’t been enough water (in 2011, 2012, 2015 and 2016) . Mobilisation and Resistance: Grasim Industries have built dams on the Chambal river at Nagda as well as at Nayan Marg village and Amavadia Bika village, and they raise the walls of the dam every few years . In April 2017, local residents protested against Grasim Industries who began raising the walls of the dam at Piplouda Bangla . They argued that Grasim Industries were raising the dam higher than they were approved to, and they were concerned that their land would be submerged if the dam is raised further . A newspaper article argues that there was an accident at Chambal river on Bigha land in 2014 due to a dam where a village sank and consequently a large part of their soy crops were damaged. The villagers were never compensated for this and the protesting locals were concerned that their land would be at risk of similar accidents . Grasim Industries has been in Nagda for a long time (since the 1950s) and consequently brought a lot of economic activity to the town. This has created a dependency for the surrounding villages. 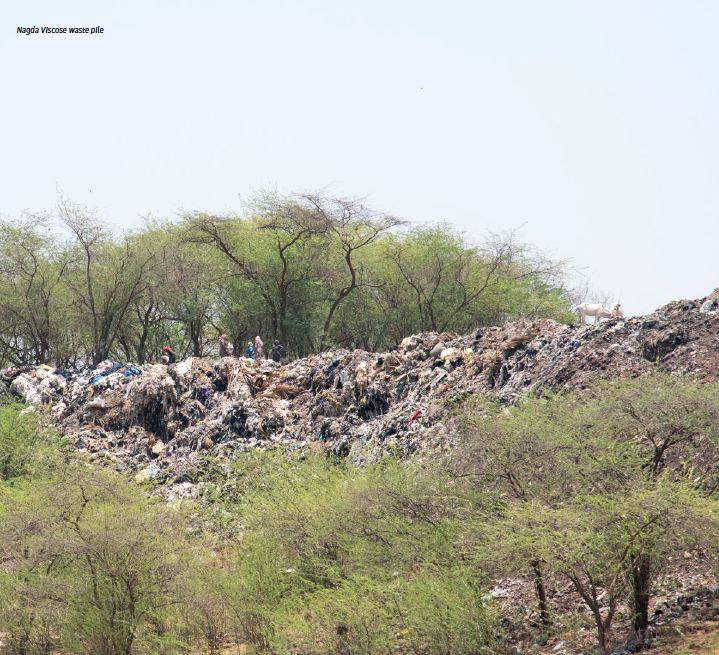 In fact, when Changing Markets investigators interviewed villagers around Nagda, many of them said that they would prefer Grasim to clean up their activities, rather than stop them or leave the area . This is just one example of a very common theme where local communities become economically dependent on polluting industries, and thus want them to stay even though their health and environments are being harmed by the industrial activity. One could categorise this behaviour as “resigned activism”, as coined by Professor Anna Lora-Wainwright . A booklet entitled “The Gas Chamber on the Chambal” was published by V.T. Padmanabhan in the 1980s. Christopher Pinney quotes the following form the booklet in his article: “The wheels of industry kept on moving, with ever increasing speed. Production and profits climbed new heights. Cartographers translated them into the language of lines on graph sheets, to be proudly displayed in air conditioned rooms. Managers smiled. Trade Unions bargained for bonus. And, the men who worked on the shop floor containing deadly gases vegetated and marched slowly towards their graves (Padmanabhan 1983: 4). . This shows that resistance against the Grasim plant at Nagda has existed for over two decades now. In his article, Christopher Pinney argues that Grasim industries has been linked to and many times accused of causing diseases in plant workers and villagers over the years . He states that “Workers and people in Nagda are affected by this and many have diseases like paralysis, diabetes, heart attack, mental illness, lung cancer, skin disease and impotence (napusanktva).” . 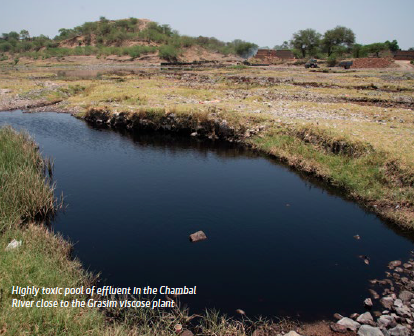 Environmental and Health Impacts: The Changing Markets report cites a study conducted by the Indian Institute of Soil Sciences, which claims that Grasim Industries is causing groundwater pollution, affecting many villages located downstream of Nagda . Effluent pollution may of course be dangerous for the health of nearby villagers, however it may also have detrimental impacts on the soil quality of agricultural land, effectively damaging crops . Investigators observed blackened water with streaks of colour flowing through in the Chabal river just a few kilometres away from Nagda . This kind of pollution also spreads an extremely bad smell, which has become an everyday situation for many villages; for instance local residents of Nagda have many times complained about the bad stench of “rotten radishes” which is a typical characteristic of the chemical used in viscose production. The same investigators also claim that “the factory also dumps huge quantities of its viscose rejects on the bank of the river which are washed away into the river during monsoons” . It is believed that there has been several cases of employee deaths due to chemical exposure at the Nagda plant. However, villagers claim that information gets covered up as victims are sent to the company owned hospital, and in the case of deaths they are recorded as deaths due to natural causes . Furthermore, workers are often hired by intermediary contractors, which means Grasim Industries are not as accountable, and workers are left with very little protection . Villagers that live along the Chambal river have a hard time proving the cause of diseases when villagers suffer from cancer or birth defects, although many of them believe it is caused by the toxic waste and pollution coming from the viscose plant . Project Details Grasim Industries has 4 viscose plants in India with a combined capacity of 498,000 tonnes per annum. At Nagda, about nine hectares is used by Grasim Industries. “The population of Nagda municipality is 100,039 as per the 2011 Census of India, out of which around 31,000 individuals are engaged in work or a business activity.” . According to Changing Markets, Grasim Industries has also proposed to expand their viscose staple fibre capacity from about 1,44,175 tonnes per year to 2,33,600 per year, as well as increasing their sulphuric acid production (Sulphuric acid is a chemical which is used in the production of viscose) . This is expected to put an even heavier burden on nearby villages as Grasim Industries will require even more water form Chambal river for the expansion to be possible. Why? Explain briefly. The Grasim plant is in operation and not likely to stop its activities. Sufferers have not received compensation. Pinney, C 1999, 'On living in the kal(i)yug: Notes from Nagda, Madhya Pradesh', Contributions to Indian Sociology, vol. 33, no. 1-2, p. 77. Patrika News 2017, "Grasim and rural face in Nagda controversy over increasing the height of the dam"